The Supervisory Board of the Open University of the Netherlands has appointed prof. dr. Theo Bastiaens as the new rector magnificus. On 1 January 2019 he will be succeeding prof.mr. Anja Oskamp. Bastiaens is currently vice-president of the FernUniversität in Hagen (Germany) and (part time) professor Educational Technology at the Open University. To the AACE community Theo Bastiaens is best known as a dedicated conference chair of the EdMedia conference (currently), and the ELearn conference (immediate past chair). For AACE Review, we talked about the Edmedia conference and the role of open universities in setting the research agenda for the edtech community. Congratulations to a well deserved appointment, and a very successful Edmedia conference. 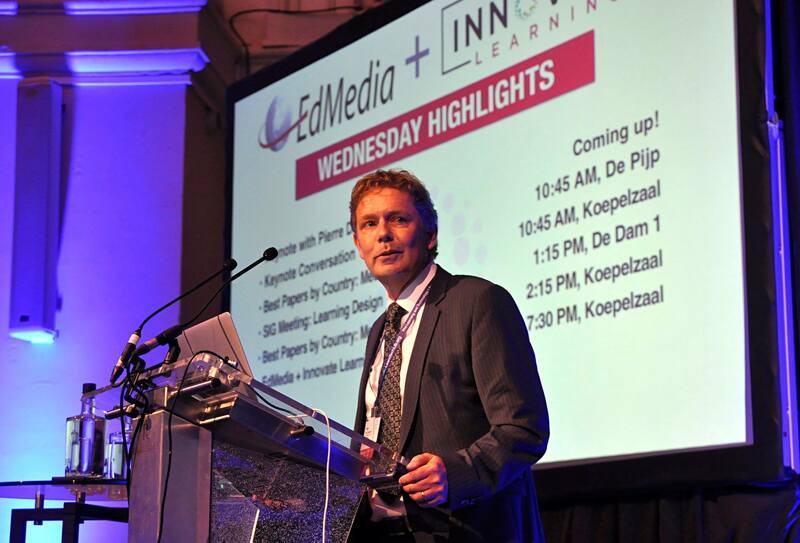 Edmedia in Amsterdam concluded last week with hundreds of presentations, posters, five keynotes and a panel discussion. What are some of the topics that stood out to you? Thank you very much. I look forward to the new position. It is of course also a little bit sad to leave the Fernuniversität in Hagen after 13 years. I will miss my team and colleagues very much. Luckily we have conferences like EdMedia/Innovate Learning to meet again and discuss ideas and our research. So what stands out for me, especially this year, are the many possibilities for networking, discussion and meeting other researchers. There was a good vibe, the beautiful city of Amsterdam and the sunny weather were a perfect context for EdMedia/Innovate Learning. The quality of the keynotes and the many other submissions were wonderful. A specific topic that stood out was computational thinking. It is really happening, were are going to prepare students for a new (complicated) labor market. Computational thinking and having an insight in the systematic way IT systems work are one of the most important 21th century skills. Among the best paper awards, do you have a personal favorite that is particularly relevant to your work? That is a difficult one…I read all best paper awards after the peer reviewers selected those. Every year these papers are very interesting to read. I would recommend everyone to, at least, read always all best papers. I want to highlight something else…this year we had five country slots…. five countries presented their best papers. Local research organizations handpicked their best research for the moment and these projects were presented in one session. Very interesting, so my favorites were those country papers (which by the way all got an country paper award). This year we had Finland, Germany, Austria, Ireland and the Netherlands. Next year we will probably add new countries. So if your country wants to represent their best educational research at EdMedia/Innovate Learning you can contact me. Your appointment as rector magnificus of the Open University NL was announced during the Edmedia conference, with considerable press attention. Can you describe how your role as conference chair enhances your university leadership? It is definitely a great value to be active in an international conference network. You hear and see a lot, meet new people and can collect interesting ideas. Many ideas to bring back home and to try out for yourself. Also the possibilities to collaborate and publish together with other international colleagues add value to your CV and leadership skills. Educational leaders nowadays have to have international skills in a globalized world. I attended my first EdMedia in 1995 in Graz, Austria. So I have been working on those skills for a long time….it finally paid off J. The Open University UK releases an annual trend report on ‘Innovating Pedagogy’. What role do you think specifically open universities have in shaping the research agenda for the educational technology community? Well, to be honest I think that a lot of innovative ideas in educational technology came from Open Universities the last twenty years. George Siemens had his idea of connectivism when he was working at Athabasca University and Jeroen van Merriënboer developed his 4CID ID Model while working at the Open University in the Netherlands, not to mention all the good work for Open Educational Resources that happened at the Open University in Milton Keynes. But we cannot sit still and rest, other universities are catching up. We live in an exiting time… I wonder who will be the future leader in augmented reality, robots, data analytics and Artificial Intelligence. This is the time for open learning and it must be extended to Africa especially teacher universities such as the University of Education, Winneba in Ghana. This will extend higher education to all including students with disabilities. You are welcome Prof. dr. Theo Bastiaens. Congratulations on this well-earned promotion. The Open University of The Netherlands is wise move you up after so many years of strong scholarship. The AACE community values your huge contributions to E-Learn, ED-MEDIA, and other initiatives. Thank you.